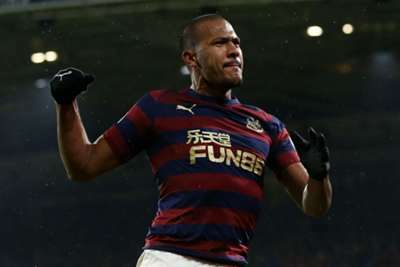 Salomon Rondon's goal settled a scrappy contest at the bottom of the Premier League as Newcastle United clinched a precious 1-0 win at Huddersfield Town. Newcastle were on the back foot for long spells and Rondon was isolated for almost an hour, but a clinical finish following a swift break put the visitors in front and they defended doggedly to hang on. David Wagner's Huddersfield paid the price, as they so often have, for their lack of cutting edge in the final third, with the absence of injured creator Aaron Mooy keenly felt. The Terriers remain in the bottom three, while Newcastle climb just one place to 14th but move six points clear of the relegation zone. 90' FULL-TIME #htafc 0-1 #nufc: Rondon's second half strike gives Newcastle all three points at the @johnsmithstadia. There was little quality on show in testing conditions and the first opening came from a Huddersfield corner as Laurent Depoitre wastefully volleyed over the top. A superb stop from the stretching Martin Dubravka kept out Philip Billing's long-range free-kick, before a Newcastle set-piece routine found Fabian Schar unmarked and he shot straight at Jonas Lossl. Christian Atsu tamely picked out Lossl again when the ball fell his way early in the second half, but Rondon made no mistake with his first effort of note, firing past the goalkeeper at the end of a rare flowing Newcastle move. Huddersfield went back on the attack and Dubravka parried from Chris Lowe's drive, before a dubious offside call ruled out an Ayoze Perez goal following another counter, yet the Magpies would not be denied. Both teams would have pinpointed this game as a key opportunity to pick up points and Huddersfield were in control at the break. Yet their failure to convert possession into clear-cut openings proved their undoing again and a defeat they could scarcely afford was the result. Newcastle now have a huge chance to pull further clear over the festive period. While Depoitre received little service, he passed up his big chance in the opening moments. Rondon, on the other hand, was devastating when put through on goal for the first time. His goals could be the difference between Newcastle and sides like Huddersfield this season. Had Newcastle not held on, Rafael Benitez would have been raging with the officials again this week. He called for VAR against Wolves last time out as decisions went against the Magpies and Perez looked to be wrongly denied a goal here. Referee Anthony Taylor had a poor game throughout, twice getting in the way of the ball, and both teams were left frustrated. - Huddersfield have won just two of their last 14 games against Newcastle in all competitions (D4 L8). - Newcastle are unbeaten in four consecutive Premier League away games (W2 D2) for the first time since November 2012. - Since the start of last season, Huddersfield have failed to score in 29 Premier League games, eight more than any other side. - Huddersfield posted a 73.6% possession figure in this game, the highest of any side to lose a Premier League game this season. - Rondon has netted four goals in his last six Premier League games, as many as he managed in his previous 24 in the competition. - Newcastle's Javier Manquillo registered only his second assist in his 58 Premier League appearances. Both sides will again face rivals at the bottom of the table next week, with Huddersfield welcoming Southampton as Newcastle host Fulham.